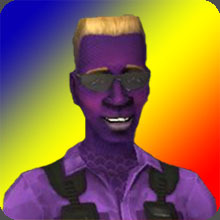 Violet Haze was a master sergeant in his home world of Pouro Polie, a militaristic world whose world leaders rent out its trained armies to fight other people's wars. However it was his brother's death, who he personally trained, that led him to question the will of his planet's leaders. Upon arriving on our world, he found new purpose, and a hope to redeem his self by fighting against the indifference so often found not only on his world, but ours as well. Armed with a new sense of purpose, and also a natural ability in team tactics, Ebon Huntress made him second in command of Team Rainbow, as well as Field Commander and team trainer for the less experienced members. He is especially pleased with the enthusiastic response he gets from Tawny Bimbo, but is forced to file regular reports on Captain Crimson's failure to show up for his training schedule.